As a team of web professionals, we have developed countless websites. We do a fantastic job of it, and our clients confirm this. Having recently redesigned our own website, hiveit.co.uk, we thought we’d share our own experience and lessons learned. But what does that mean? And what did we learn along the way? Exploration for us is understanding everything we can about our potential users. This exploration may involve real individuals or hypothetical archetypes of actual users. For us, what’s important is having them at the heart of the design of our website. Put simply, our website is for them, not for us — okay, so the colours might be for us — but we want to know why our users might visit our website, how they are visiting us and for what purpose. This allows us to make sure they seamlessly get the information they need. We could have cracked on with designing a new website without exploring who our users are and what they want. However, it would probably have resulted in making time consuming (and therefore costly) mistakes, which will have affected the quality of the final product. So, we developed key personas, mapped out their user journeys and used this to establish what kind of touch-points we needed to focus on. Next was the really fun bit: holding a sketching workshop with the team. Sketching workshops engage the team and get ideas down on paper before considering technical practicalities. It’s an exercise anyone can take part, and it’s one of our favourite techniques. We came up with lots of funky ideas — perhaps too many. Without the constraints of a fixed budget and a hard deadline, we visualised the moon on a stick. So, our principal UX designer Martin Smith had the unenviable task of translating our vision. Martin collated and analysed all the information we had and put together an interactive prototype (using Proto.io) so we had a common understanding of key sections, interactions and the information architecture of the new site. We then got busy doing other things, and progress stalled. There was little feedback on the prototype and our key resources got busy on client projects. The failure we recognised was that the project had no clear ownership and hadn’t been given the importance it deserved. At this point we changed focus. Rather than being an internal project, we switched to what we do best, client work. We appointed a Project Manager, we ringfenced our resource, we set a budget and a deadline and we nominated a Product Owner. Limiting the scope allowed us to do our best because it focused our energy and attention on achieving a goal, within the confines of the constraints. Given the new focus, we were able to break down the effort into sprints and assign tasks accordingly. Our visual designer Allan was able to pick up the prototype, apply branding and build the pages and components. In addition to wireframing and branding we worked with an incredibly talented copywriter called Ellen Holcombe who helped us define our tone of voice and messaging for the website, making our copy consistent and reflecting us as a company throughout the site. So, we’ve got the copy, branding, visual design elements and some wireframes from the design team. This meant our Senior Developer, James was able to start building the required page templates in our chosen Content Management System (CMS), Craft. There are so many CMS choices out there and part of our job is about recommending the right CMS to our clients. We chose Craft because, it’s fast, it’s great value for money and does everything we needed. So that subtitle is a little misleading, because the process of refining our website will be an ongoing one, it’s not a single task that we can easily complete and just head to the pub after a good job well done (we do this anyway). We have launched in public Beta, and are inviting feedback from our users. Even digital agencies find it hard to design their own website — it can be such a personal process! That’s why our clients ask for our help, that’s why we looked for outside help and knowledge when it came to talking about ourselves and our tone of voice. It’s so easy to let our own bias creep in and, like writing your own CV, everyone finds it hard to talk about themselves. Our design team have done an amazing job at keeping the focus on our users and their needs. The experience overall has been invaluable and the outcome is something we feel proud of as a company. We also have so many exciting features to add over the coming months. Following our own process and experiencing the challenges from both sides will help us understand our clients more and reinforces the fact that collaboration and focusing on real users is the key to doing great work. 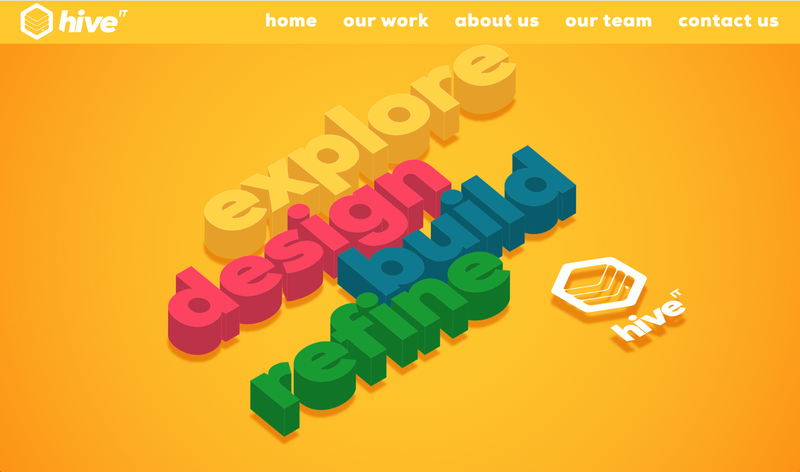 We feel the new website is a reflection of all the best bits that make up Hive IT and hope that you do too! There are new features to add and more user testing might mean further refinements down the line. The digital landscape is always changing, but what is for certain is that we plan to keep improving, and our website will continually evolve as we do.